Here we go with the Nutella again! Looks like Nutella is kind of a theme this week with my recipes, huh? 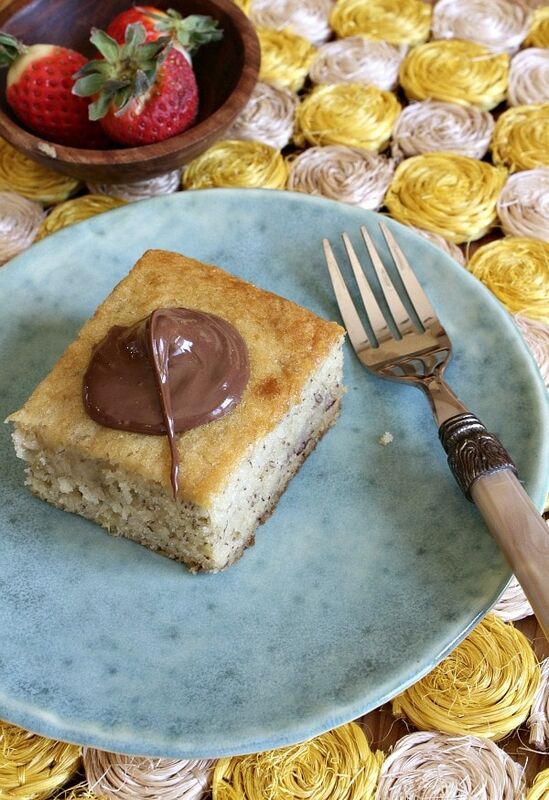 This time I created a tender-crumbed Banana Snack Cake with Nutella “Frosting.” The cake itself is simple, and it’s delicious enough to eat on its own for snacking. Nutella is optional, but a good dollop scooped on top is kind of a good idea if you enjoy the stuff. It makes for a nice after-school snack. Chocolate + Banana is a very good idea. I shared this recipe on Parade Magazine‘s food blog. The recipe can be found > HERE. I made your Banana Snack Cake with Nutella Frosting this week. Wow, you were so right about that little bit of Nutella– Delish! See I have one problem with Nutella…. Perhaps it is due to poor planning, but as soon as I open it up…. Its gone. hmmmm. This looks awesome. Heading over to Parade now. Too bad I’ve already got the blueberry-raspberry muffin batter mixed up (ok, and no ripe-and-ready bananas either) because I think my kids would rather have this snack cake instead for after school snack. Can you tell me about the table runner? It’s just a pretty, textured placemat. Not sure where I got it! I LOVE banana and this looks so good! I think i am going to turn into a banana! I have been all about banana everything lately, and adding nutella just makes me want this more!! I like that this is a snack cake as opposed to a regular cake. That means I can eat it for breakfast, lunch, and dinner. Two banana recipes in a row…I have a feeling you are like me and had a lot of bananas on the counter! Looks yummy! I have nothing against Nutella but I think that banana cake would be delicious on its own without it! It is officially the Year of Nutella! It does go brilliantly with banana, though. Nutella and bananas always go together in my book! I am always up for more nutella! This looks wonderful! Now this is my kind of snack! These look so lovely and full of flavor. Thank you for sharing, Lori! So excited to meet you at the Ziplist meet up before BlogHer Food! Oh, this looks so moist and delicious! I need to make this next time I have over-ripe bananas. That’s so cute your son has a RecipeBoy blog to follow in your footsteps! Looks like a perfect after school snack. Thanks for linking to my Snickerdoodle Snack Cake. I love that big blob of Nutella! And one can never have too many banana bread recipes!